Concept for selsyn driver (the other half of the anemometer question)? Will this work? I need to drive a number selsyn indicators spread around our airport museum. The circuit on the right is the indicator instrument while the Arduino etc on the left simulates the selsyn transmitter. The ones we have are 50Hz 50volt instruments hence the need for the transformers which step up the lower voltage and also to provide DC isolation. H Bridges will be higher current devices and 40volts supply. As I understand it the way selsyns operate is that they are AC devices where each of the three legs has a voltage induced of amplitude according to the position of the single winding rotor. At any time one or another of the three legs is antiphase to the other two. I intend to use PWM to produce the amplitude and the H Bridge to provide the antiphase when required. All H Bridges will be changing polarity every 20ms to produce the basic 50Hz required by the instruments and the transformers. 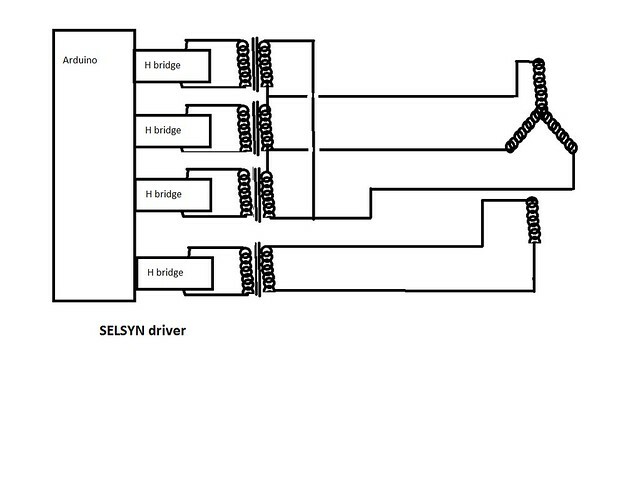 Re: Concept for selsyn driver (the other half of the anemometer question)? Sorry I missed the first part of this, I guess there’s a reason not to just put a synchro transmitter on your anemometer? Have used synchros/maglip quite a bit and I’m not sure about using PWM. One of my concerns would relate to the impact of the non-sinusoidal / step input signal to the receivers, I would worry if they would ‘buzz’ – may only be a small amount but instead of the indicator making (relatively) slow wind-synchronised movements, it might also have a superimposed oscillation to & fro at up to 50Hz. Resolver ICs to take a synchro signal and digitise it are common, you may be able to find an encoder version? If you really have to start from a digital signal, then you may better with, say, coupling a stepper motor and a cheap absolute encoder, to a synchro transmitter. EDIT: just found & read the original 'part 1' so understand you may have a problem getting a synchro transmitter up at the actual windvane location. Would still suggest that you drive the synchro indicators with a proper synchro transmitter; so have a 'master display' which has both an indicating needle and synchro tx on the same shaft, and drive that with a digitally controlled (stepper?) motor and encoder (just using a stepper motor for displays - be they wind direction or speed - will be OK incrementally but absolute start position could be anywhere in 360* so need an encoder OR a reference procedure whenever powered up to drive each stepper round until it makes a reference switch like a slotted opto switch). Thanks Dave, I do have a synchro transmitter and a stepper to drive it as an emergency fall back position but you must know this is 'MadModder's' site where one must always try the unconventional way first. Yes, there may be some unexpected effects of PWM drive to the instrument but these things are damper than a wet afternoon in Hokitika and I think most of the museum visitors will be suitably impressed if the needles are just moving somewhat in sympathy with the conditions outdoors. I am using steppers on the wind speed indicators which I have to make from scratch and steppers are used because I doubt I will ever find any analogue meters with 300 degree movements just lying around anywhere. They are noisy and the movement is very unrealistic. Thanks Dave, I have not yet abandoned the authentic indicator displays with the selsyn drives but the RC servo is a definite option for the wind speed indicators which need about 300 or more degrees of movement.